With college game film, the combine, pro days, private workouts, and interviews, you'd think NFL teams would have enough time to get to know draft prospects. They always want more, though, and they don't care what they have to do to get it. 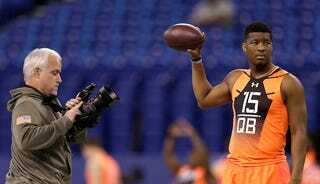 Per Yahoo's Charles Robinson, Jameis Winston's trainer George Whitfield claimed that one team monitored Winston while he was on a flight during the combine. "How does he get along with other passengers? Does he get a beer or stick with water? Peanuts or a Kit Kat bar?" Easy jokes aside, this is insane behavior. Scouting can be so goddamn creepy.